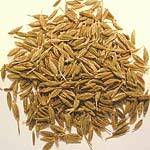 Cumin seeds are one of the world's most popular spices, especially beloved in India, Asia, South America and North Africa. 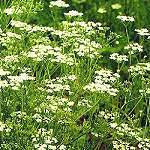 Europeans have recently become acquainted with the cumin flavour from the influence of the 'cuisine' of the Near East. A falafel would be impossible without the cumin flavour. Moreover, the seeds form an important part of curry powder. 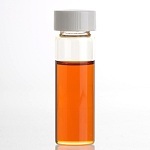 The main component of cumin essential oil is 4-isopropylbenzaldehyde or cuminaldehyde (> 30 %), together with smaller amounts of p-mentha-1,3-diene-7-al, p-menth-3-ene-7-al and gamma-terpinene - all compounds with the same carbon skeleton . Cyclamens are inhabitants of the mountain forest floor in southeastern Europe and the Mediterranean countries. There are around 23 species from which many cultivars have been developed, often much larger than their natural ancestors (di- and polyploid, florist's cyclamens). Most of these colorful marvels are without noticeable scent. However, some of the native species are highly fragrant. The flower scent of C. persicum (upper photos) is characterized by the sesquiterpene alcohol (-)-(E)-dihydrofarnesol which has a diffusive, floral-green odor (this alcohol, also known from lily-of-the-valley and skimmia, is available as a perfumery chemical from the Japanese company Takasago) . The flowers of C. alpinum (C. trochoperanthum, lower photos), a species from the Anatolian region i Turkey, smells like "heather honey". Nohara et al. analyzed the scent of these flowers and showed that the main constituents are phenylacetaldehyde (32 %) and 2-methylamino-acetophenone (31 %) together with 2-dimethylamino-acetophenone and 2-formylamino-acetophenone. The nitrogen-containing compounds are responsible for the characteristic scent of the flowers . 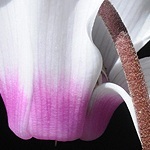 The storage organs of cyclamens are mostly round and somewhat flattened tubers with size depending on species. 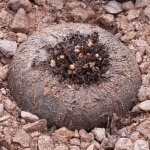 Those of C. hederifolium, for example, commonly reach a diameter of more than 20 cm! 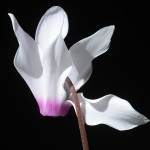 Etymology: Cyclamen, Gr. kyklos, circle, probably because of the round tuber. 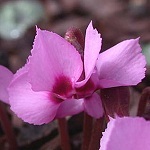 A certain range of pink colors are named cyclamen. 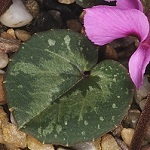 The distribution of Cyclamen species is shown beneath. Cyperus is a large genus of sedges, the most famous of which is Cyperus papyrus, used in ancient Egypt for making paper. Another sedge, Cyperus scariosus, is known in India as Nagar Mustaka or Nagarmotha. The aromatic roots of this "marsh grass" have been used in the same way as vetiver roots for the scenting of saris and other women's clothing. By steam distillation of the roots, the so-called cypriol or cyperus oil is obtained, having interesting perfumery properties. It has an Oriental character - a diffusive, woody-earthy odour with notes of cinnamon, cedar and frankincense. The main constituents are sesquiterpenes, sesquiterpene alcohols and sesquiterpene ketones, some of which are shown . Cypriol was used, for example, in Xeryus (Givenchy 1986), a floral, woody, semi-Oriental fragrance developed by Firmenich. P.S. 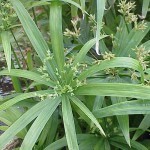 The photo shows the closely related Cyperus diffusus. dark-green crown is a pictorial element of the landscapes and is seldom missed in paintings from this area. It origins in the eastern part of the Mediterranean area but was early imported to Italy and soon found its way towards the west. 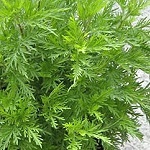 Artemisia pallens is a small, herbaceous plant with an exquisite aroma. 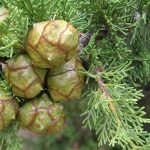 It is grown in the southern parts of India, particularly in the states of Karnataka, Tamil Nadu and Andhra Pradesh. 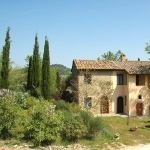 The fragrance of the herb and its essential oil is described as deep, mellow, persistent and characteristically fruity. Hindus are offering the flowering plants to Shiva, the God of Transformation. 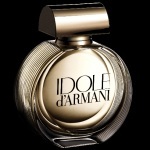 Idole d'Armani (Armani 2009) includes davana oil as a special note. Davana oil has a number of rare furanoid sesquiterpenes as major constituents, e.g. davanone (> 50 %) and davana ether. Other important odoriferous ingredients are methyl cinnamate and ethyl cinnamate   .